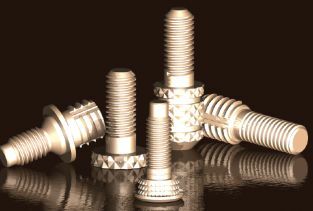 A range of Tappex inserts with male threads or studs is available based on the same body design and installation features of the basic female equivalent: Trisert®, Multisert® or HiMould® , in both Unheaded and Headed versions and with the same Short, Regular and Long body length variants and then with a defined threaded-stud length (sometimes referred to as ‘nut engagement length’ or NEL). Customer requirements for male inserts have proved to be so varied it is difficult to stock a ‘standard’ range of inserts. Tappex have therefore decided to treat every ‘male fastener’ application as effectively a special in order to meet the designer’s specific needs. Where possible, if we have previously designed & manufactured a male threaded fastener of similar geometry that will be offered first as an alternative so as to eliminate the need for special manufacture and hence reduce costs and lead-time wherever possible. As the head profile of a Tappex male insert would normally take the form of the brass Trisert®, Multisert® or HiMould®, then it follows that the male thread required will define the equivalent female head-end size. Details of the head end dimensions may normally be taken from the equivalent female product pages on this web site. Male inserts maybe manufactured in either brass or steels dependent upon application requirements – contact the Tappex sales office for further advice before specifying. The coding for a Tappex male insert always commences with the number 5 and is followed by the part number for the equivalent profile found in the range of female inserts. (The number 5 replaces the first digit of the female part number). Each of the male inserts retains the basic design and installation features of the female version. Headed, Unheaded, Short, Regular and Long can all be produced. Head End – The profile of the fastening end of the male insert that is fixed into the parent material. Head Length – Normally the overall length of the equivalent female fastener. Overall Male Thread Length – The overall length of the male insert less the head length. This may incorporate special ends to the thread to assist in location of the nut or other customer design requirements. Plain Portion – There is a run out between the commencement of the thread and the shoulder of the head profile, which is generally restricted in length. Nut End Length (NEL) – This defines the maximum distance from the commencement of the chamfer at the end of the thread to the head profile and incorporates the plain portion. For a suitable post installation application cold pressed male Multisert® are the quickest to install and thus most economic whilst providing high pull out performance. If greater pull out performance is required then a male-Trisert design can be specified. Ultimate performance can normally be achieved with a male-HiMould® design being moulded into the parent material, can be used if suitable for processing. Having decided on the most suitable method of installation and therefore head end design, the overall male thread length and nut end length (if different) should be defined. Generally, the designer should always consider specifiying the NEL length and plain portion in conjunction with the thread dia and application performance required most carfully. Excessive length of the stud beyond that whch is supported by the plastic moulding or machined part could generate significant bending moment whislt stretching the thread of the plain portion is 2.5 times the thread pitch for nut end lengths of four times the thread diameter or less, or four times the thread pitch for nut end lengths greater than four times the thread diameter. In practise these are gauged with 6g thread ring gauges and generally a minimum of half a thread pitch can be deducted from the plain portion length when using standard nuts. The diameter of the plain portion will never be greater than the thread diameter plus 0.2mm and never less than the maximum effective diameter. Where customers require the fixing of a relatively thick mating component, there is no need for the thread to extend the whole length of the insert. An excessively long thread length can weaken the fixing due to the thread stretching under the tightened nut. The hole designs for the equivalent female will apply. Heat installation of male Multiserts ® should generally be avoided due to the extra time required to heat them up and movement afterward, as they then take longer to cool down acting as a heat sink. Certain materials or thin walls may still necessitate their use in this way. If the insert is to be installed into a blind hole, air may be trapped beneath the insert becoming compressed and reacting against the downward pressure pushing the insert back out of the hole. In this situation a 1mm key way should be introduced 0.8 times the head end length – if in doubt please contact Tappex for further advice. Description: The Male HiMould is designed to be moulded-in. The external form has a diamond knurl with two undercuts. The part number is defined by the female body size a number 5 replacing the first 1. Special ends to the thread such as dog point or chamfer may also be specified. Application: This insert provides excellent pullout performance and resistance to rotation. Installation: The Tappex HiMould style male insert is designed to be installed into a recess or pocket in the mould tool. Where access to the rear of the insert is not feasible or acceptable to the design a sealing feature can be incorporated in the plain portion to prevent the molten plastic reaching the threads.